Miaow. 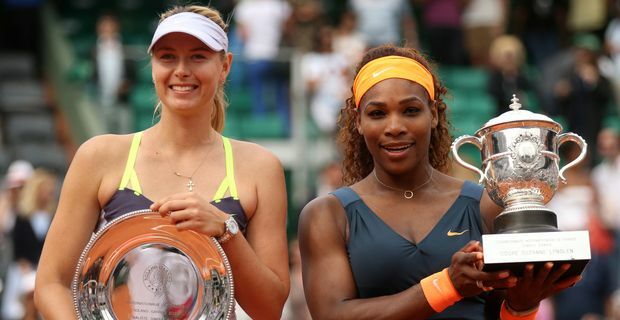 The on-court rivalry between Serena Williams and Maria Sharapova is weighted so heavily in the American's favour that she has decided to make it more interesting by throwing a few personal jibes into the mix. The Russian has responded with a mixture of injured dignity and some moderately bitchy remarks of her own. Williams, who probably won't be contemplating a career in the diplomatic service when she hangs up her tennis racquet, put down a pretty strong serve with some pointed remarks about Sharapova's personality (without actually naming her), in her controversial interview in Rolling Stone. "She begins every interview with 'I'm so happy. I'm so lucky' - it's so boring," Williams said. "She's still not going to be invited to the cool parties. And, hey, if she wants to be with the guy with a black heart, go for it." Whether there are that many "cool parties" on the women's tennis circuit must be open to doubt. By the "guy with the black heart" Williams was presumably referring to Sharapova's current boyfriend, the 22 year-old Bulgarian player, Grigor Dimitrov, with whom Williams has unhappy history. Ball in Sharapova's court then. "We have a tremendous amount of respect for what we do on the court," Sharapova hit back with gentle topspin. "I just think she should be talking about her accomplishments, her achievements, rather than everything else that's just getting attention and controversy." So just stick to the sporting rivalry rather than the love life, then Maria, that's the civilised way? She retained the moral high ground for oh, several seconds before being unable to resist a pointed reference to Williams being linked with her French coach Patrick Mouratoglou. "If she wants to talk about something personal, maybe she should talk about her relationship and her boyfriend that was married and is getting a divorce and has kids . . ."
Ladies, ladies, save it for Wimbledon, please.